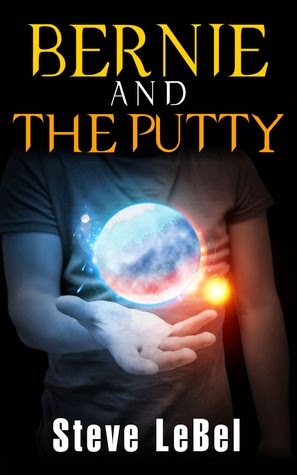 Today's book is by Steve Lebel called BERNIE AND THE PUTTY, What would you do if you are a young god an have to go to work like everyone else, Well Bernie is a builder of universes and has some trouble along the way, I was honored to get this book as part of a blog tour . How can you stop a god bent on destroying everything... even if you are a god? This humorous fantasy explores a world where Gods and Goddesses go to school, fall in love, and struggle with bad bosses and horrible bullies while designing complex universes. Meet Bernie, God School’s latest graduate, described by his teachers as careless and lacking focus, yet lucky enough to land a job building a sun with three planets. Meet Shemal, the boss who eats young gods for breakfast. When Shemal isn’t terrorizing Bernie, our young god has to deal with Billy. Think Satan is God’s adversary? Billy’s the Bully God with a grudge and a plan to sabotage Bernie’s universe with mysterious asteroids, volcanoes and more. If you enjoy fantasy and science-fiction and the twilight of the gods, this book will challenge everything you know in this terrific page turner. I was honored to get this book to review for the books to curl up with blog. I have to say I was very surprised at this book . It had me hooked for the first chapter. Bernie is a young god just finishing god school. Where he is on to bigger and better things working for the company as a builder. He is the builder of new universes and life forms. But with every bit of good there is a lot of bad , That bad comes in the form of Billy, The bully from school. Bernie doesn't get a long with Billy especially after Bernie punched him. See Bernie is a loner after he had to move after his parents divorce. He works hard and gets through school. When he starts at the company , he has his best friend his soon to be girlfriend to help him out. But , as he starts building his world some one is there to sabatoge him and all the progress Bernie has done. Will Bernie create his universe or will he be fired, You will have to read the book to find out . Steve Lebel. has written a great story of young gods and goddess's and how they have to work . They head to their jobs everyday , just like us lonely mortals do. Which makes them very human like . Thank you for your kind words, Patricia. I really appreciate it.